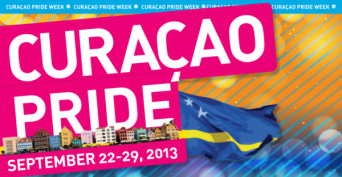 The week is over, but not forgotten, as hundreds of Curaçao visitors and residents celebrated the island’s very first Pride Week, September 25-29th, 2013. The Caribbean island of Curaçao has always been welcoming to the LGBT community with great accommodations, events and attitude, but Gay Pride Week took the island’s commitment to the LGBT community to another level. Hundreds of people showed up at The White Affair event at the Floris Suite Hotel, host property of Curaçao’s first Pride Week, transforming the hotel into “Pride City” for the week. In addition, hotels and restaurants contributed with gourmet food and drinks in support of Pride Week. They included the Hilton Curaçao, Curaçao Marriott Beach Resort, Santa Barbara Beach & Golf Resort, Kyoto Restaurant, Tempo Doeloe Restaurant, Pirate Bay, Sandton Kura Hulanda Hotel and others. Posted October 14th, 2013 & filed under Travel.